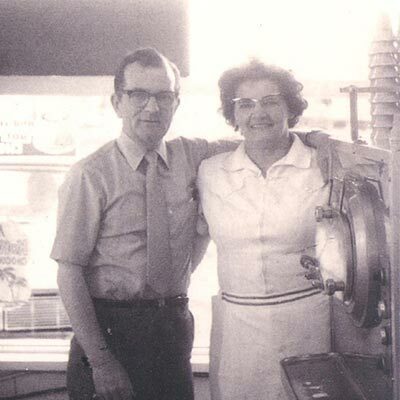 Wendell and Jean Cathers were the original owners of Merla Mae in.Thunder Bay. A city-wide tradition since the early 1950's, Merla Mae is the only licensed drive-in in Thunder Bay. Fresh Recipies all made In House! Unique to the ice cream parlours of yesterday, our ice cream flavours come from time-tested recipes all made in-house. Made with fresh ingredients, we produce for you delicious and original flavours not seen anywhere else! Treat yourself to one of our creamy, freshly-churned ice creams, or one of our authentic sorbet flavours, ordered straight from Southern Italy! We've got the scoop on our original ice cream flavours tested and loved by our customers. Our passion is to continue to provide our valued customers with new and exciting ice cream flavours not seen elsewhere! Watch for new ice cream and sorbet products coming your way soon.